Machine containers, like LXD, proliferate in the datacenters: they provide a native control plane for OpenStack and a lightweight hypervisor for its tenants. LXD optimizes resource allocation and utilization for Kubernetes clusters, modernizes workload management in HPC infrastructure and streamlines lift and shift for legacy applications running on virtual machines or bare metal. With the packages from backports you will be able to follow closely the upstream development of LXD. Especially for launch, snapshot, restore and delete LXD operations, ZFS as a storage pool performs much better than the alternatives. Testing and adjusting quickly the container resources helps with accurate capacity planning and avoiding overprovisioning. LXD profiles store any configuration that is associated with a container in the form of key/value pairs, or device designation. Each container can have one or more profiles applied to it. When multiple profiles are applied to a container, existing options are overridden in the order they are specified. A default profile is created automatically and it’s used implicitly for every container, unless a different one is specified. You should now be able to SSH into your LXD container, as you would do with a VM. And yes, adding SSH keys barely scratches the surface of just in time configuration possibilities using cloud-init. Familiarize with the functionality profiles offer, it’s a force multiplier for day to day activities and invaluable for structured repeatability. LXD creates an “internal” Linux bridge during its initialization (lxd init). The bridge enables an isolated layer 2 segment for the containers and the connectivity with external networks takes place on layer 3 using NATing and port-forwarding. Such behavior facilitates isolation and minimizes external exposure — both of them desirable characteristics. But because LXD containers offer machine-like operational semantics, for some use cases it’s appropriate to have LXD guests share the same network segment with their host. Let’s see how this is easily configurable on a per container basis, using profiles. It’s assumed that on the host you have configured a bridge, named br0, with a port associated with an Ethernet interface. Finally, we launch a new container with both the default and the bridged profile. In the command line we specify bridged last, so it supersedes the overlaping network configuration. 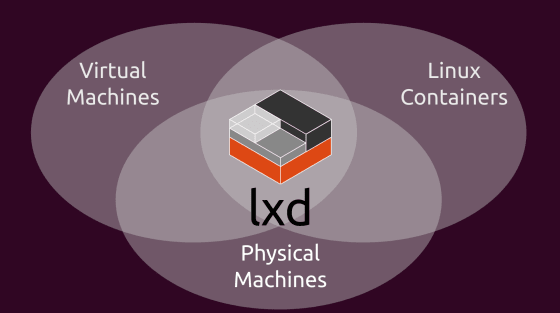 LXD in more production-like network environments. Another networking configuration alternative is macvlan but be aware of its caveats, mainly host-guest communication and hardware support limitations. These 5 easy pieces are just the tip of the iceberg. LXD liberates your laptop from the tyranny of heavyweight virtualization and simplifies experimentation. Join the Linux Containers community to discuss your use cases and questions. Delve into the documentation for inspiration and send us PRs with your favorite new features. LXD is the kind of tool that, after you get to know each other, using it on a daily basis feels inevitable. Give it a try! On February 7th, technical lead Stephane Graber will be presenting a webinar for Ubuntu Product Month that will dive into how LXD works, what it does, how it can be used in the enterprise, and even provide an opportunity for Q&A.